Cobblers boss Dean Austin has handed senior professional contracts to teenagers Morgan Roberts and Sean Whaler. 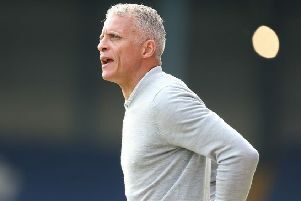 The 17-year-old Town acedemy products made a real impression on Austin during his time as assistant and then caretaker boss at Sixfields, and now he is the permanent manager at Sixfields he has moved quickly to tie them to the club. Roberts has signed until the summer of 2021, and Whaler until the summer of 2020. Midfielder Roberts is still in the under-17 age group, and was named as a substitute in Austin’s first game in caretaker charge at Blackpool. He then made his senior debut as a late substitute in the Cobblers’ final game of the Sky Bet League One season against Oldham earlier this month. Whaler is in the under-18 age-group and has yet to make his first team bow, but as with Roberts he has been in and around the squad on match days and was on the bench for the trip to Bury, and both of them have regularly been training with the first team in the closing weeks of the season. Whaler has signed his deal after coming to the end of his two-year scholarship period. He is a player who can play at right back, on the right hand side of midfield or as a number 10, and he has been in great form for Jon Brady’s under 18 side, scoring nine goals in the second half of the 2017/18 season. He joined the Cobblers academy as an under-9 player. Roberts was still a first-year player and was only half way through his two-year scholarship period, but he is now a first team squad member. He is a creative left footed player and something of a set-play specialist, and he operates in the number 10 role. Roberts also joined the academy as an under-nine player. Both Northampton lads, Roberts and Whaler are former pupils at Northampton School for Boys. Roberts is also the younger brother of another Town academy product Connor Roberts, who spent one season as a professional at Sixfields in 2014/15, without making a senior appearance. The pair signing means there are now 25 Cobblers players under contract for next season, five of whom are academy graduates in Shaun McWilliams, James Goff, Joe Iaciofano, Roberts and Whaler.